INAF is an Academic Member of the OpenPOWER Foundation. OpenPOWER is an open development community using the Power Architecture to serve the evolving needs of customers and of the research institutes. Power Architecture is a set of technologies around RISC instruction sets for microprocessors and platforms developed and manufactured by such companies as IBM, Freescale, AppliedMicro, LSI, e2v and Synopsys. The governing body is power.org, comprising over 40 companies and organizations. The OpenPOWER Foundation was founded in 2013 as an open technical membership organization that will enable data centers to rethink their approach to technology. Thanks to this Foundation the Power Architecture is now an open architecture. Member companies are enabled to customize POWER CPU processors and system platforms for optimization and innovation for their business needs. These innovations include custom systems for large or warehouse scale data centers, workload acceleration through GPU, FPGA or advanced I/O, platform optimization for SW appliances, or advanced hardware technology exploitation. OpenPOWER members are actively pursing all of these innovations and more and welcome all parties to join in moving the state of the art of OpenPOWER systems design forward. Collaborate with companies to develop hardware and software solutions. Contribute to the evolution of Power Architecture. Develop products and drive strategic direction of the OpenPOWER ecosystem. The OpenPOWER Foundation is governed by its Board of Directors composed of Platinum member delegates and group delegates from the Gold, Silver, and Associate/Academic membership tiers. The current members are listed here. 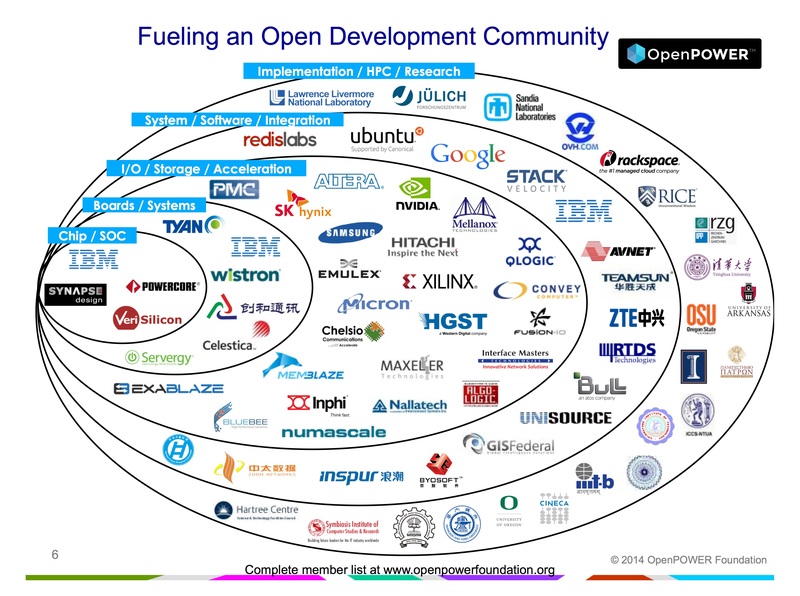 The OpenPOWER Foundation is organized in working groups. Each working group has the main purpose to discuss and contribute in the evolution of the Power Architecture. Work group activity including proposals for new work groups, work group charters, projects, and work product is developed at the Work Group level. As Academic member INAF has planned to organized a work group that cover the needs of astrophysics (current and future observatories, astrophysical simulations, etc) to focus the members of the Foundation on the needs of astrophysics and to contribute to the evolution of the Power ecosystem, and to collaborate with companies to understand if OpenPOWER can provide solutions for the astrophysics.